I was finally able to get the brakes repaired and am now back on the road. The caliper on the right front brake had seized causing all kinds of damage to my rotor. I had to have that replaced as well as both front brakes replaced. I then headed to Laramie, WY where I had to have my drug test performed for my Amazon stint this winter. 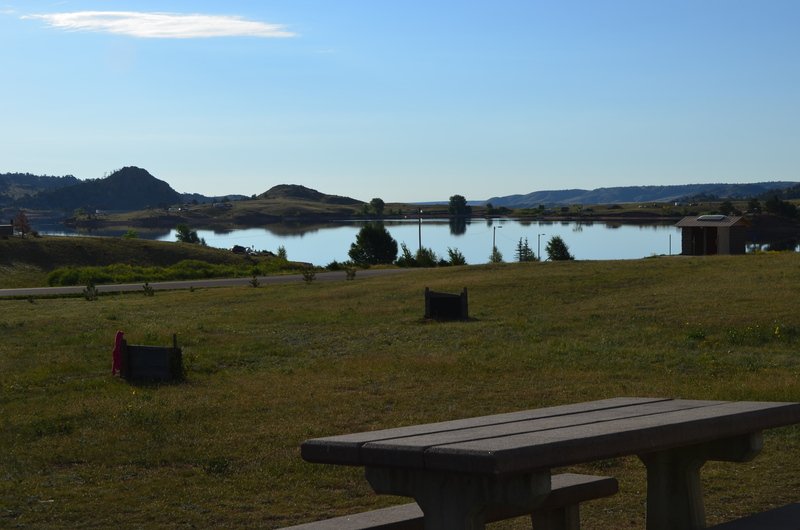 I spent one night outside of Laramie at the Curt Gowdy State Park. It was nice but hard to get level and they charge $17 a night for no hook-ups. If you have a boat it would be a great place to go. I spent a couple of nights in Laramie at a KOA thanks to the advice of Steve. It was nice but too expensive for my taste. I would much prefer boondocking down a lonely country road. I then headed back to Saratoga, WY to pick up my mail. I was only going to stay there a couple of days before meeting my friends in Colorado, but wound up being there for a week. This was when all the rain began and the major flooding in Colorado. I didn’t want to even drive into any problems due to weather. Besides I had an electric site for only $10 per day. It rained and was overcast almost every day so I was glad to have the electricity. Meeting friends in Salida, CO? I was going to drive to Salida, CO where I was going to meet up with friends and then travel further south. This is where the fun began. I got to the 40/70 junction in Colorado and my brakes started getting REALLY mushy. I had been going down a long grade behind a truck hauling timber. There were many turns where you had to slow down to 20 mph. Not very fun! Then I noticed my brakes smelling and pulled over for about an hour to let them cool down. Obviously it wasn’t enough time and it scared the crap out of me further down the road just past Empire, CO. I located a Minton Park using my Ultimate Campgrounds app on my IPhone. I unhooked and drove back there to check it out. Fortunately Empire was only a mile from where I had pulled over. The park sign said you needed permission to camp there, but no one was around. I then drove past their Police Station so decided to check with them. They gave me permission so I figured that was good enough. I then used the Allstays Camp and RV app on my IPhone to check the grades of the roads leading out of Empire. I did not want to go west as I originally planned since there were several long grades so I decided I would go east to Denver and have my brakes checked there. But after looking at the map I determined that was not the best idea either since there were two truck runaways at the bottom of 70. I still didn’t feel comfortable driving so I contacted Coach Net and had them tow my rig to a Ford dealer in Denver. When I got there in my Sami the dealer told me they could not work on my rig because of the length. Doesn’t this sound familiar? I test drove it around a bit and didn’t notice a problem with the brakes so I hooked up the Sami and decided to head on down to Abiquiu Lake to meet up with many friends who were camping there. I knew I25 was flat with no major grades and the brakes were performing as they should. To make a long story short I believe getting new brakes and immediately heading into the mountains with major downhill grades is not the thing to do. They heated up on me and I was very lucky nothing major happened. I drove the 448 miles to Abiquiu Lake, NM without any problems. There are many of us parked here for a week prior to moving on to the Albuquerque, NM Balloon Fiesta starting at the end of the month. Got my hands slapped big time! I was also notified by my Internet provider that I have exceeded their monthly limit big time. While still in Wyoming while boondocking on the Wild Horse Canyon road I may have mentioned that I was about a mile from the towers. I had great 4G reception and nobody to talk to way out in nowhere land. So what do I do. Watch free movies from my Amazon Prime account and several Angels baseball games as well. Well that caught up with me and they cut off my usage until the beginning of next month. That is why I have not blogged since 9/5. Jeannie of On the Road with Riley fame is parked next to me and was very gracious in allowing me to use her Internet connection to make this post. Thanks Jeannie!!! Yes it has been a crazy month and glad everything has settled down. Now I am doing what I enjoy. Camping in a beautiful spot with great friends. This was a sunset pic taken the other night. As always the sunsets in NM are spectacular. Thanks all for being so patient. 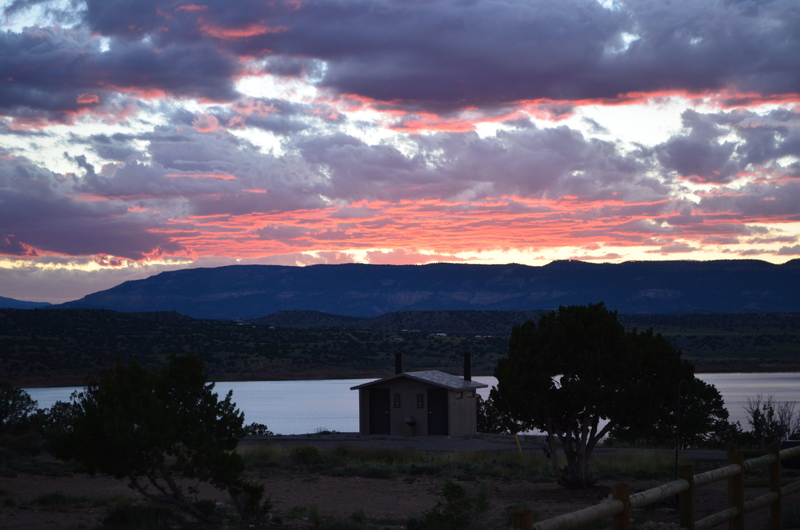 This entry was posted in Abiquiu Lake, My Friends, Truck Service, White Mountain BLM, Wyoming and tagged Abiquiu Lake, Boondocking, Friends, New Mexico, Wyoming by Jim Melvin. Bookmark the permalink. The brake problem would have scared me too. Glad they are working fine now and hopefully will stay that way. I love NM so have a great time with friends. The balloon festival should be fantastic and hopefully you’ll be able to post some great pictures. Jimbo, I am glad you made it ok. You made a wise choice having it towed and not driving bad brakes on 70. There are way too many RV wrecks on that road already. Love the pic of NM. Have fun at the festival, I look forward to some great pics from there. Man, I love Abiquiu.. I have camped there many times. What internet did you run out of? What does your buddy have? Did you use your Dish Network? Have fun and have a green chile enchilada for me. Jim if you just had the brakes repaired they should have given you no problems. Do you have brake assist in Sami when you are towing. If not that could be your problem. Most people don’t realize that the front brakes do 85% of the work when you need to stop and overheated brakes don’t work very well. You might also just pop the top open on the Master Cylinder to be certain that you have enough Brake Fluid. If it is low you’ll have spongy brakes so get it filled because you don’t want to get air in your brake lines. Be Safe and Enjoy! I am a little miffed that CoachNet would have your rig towed to a shop that would not work on it. Seems they would check things like that. Glad that all is well now. I wanted to go to a medium duty truck service, but the couldn’t get to me for a week. They called and said this Ford dealer could do it. When I got to the Ford Dealer the service rep Coach Net talked to told me they said my vehicle was an Econoline wagon. Not hardly. I suggest you emphasize exactly what you have and even call the dealer first. I’m glad you’re safe, and all’s well that ends well. I was beginning to worry something bad had happened to you! I always enjoy your blog!! Hi Jim, I’, in Fernley, staying at the Sage Valley RV. I’m have brake problems too. There goes all my Amazon money. Do yo know of a good shop in this area? When are you getting here? Hope to see you soon. Sorry to hear about your brake problems. There is a place directly across from Amazon that you might want to check out. They did some work for me a couple of years ago. Thanks I will check them out. Have fun at the balloon festival. I love you pictures of Chica, either she is very photogenic or you’re agreat photographer. Any way, you make a great team. Good to hear that you are safe. P. had problems once with the breaks when we owned an older class C RV. That is not the thing you want to have around. We agree with Rick. Get that checked out as well. Great photo of the sunset. Love the pink lined clouds! Jim, there is a chance that you got your brake lines or caliper plugged up. It hinders the brake fluid to return to the fluid container and makes your brake stay on. We had that with our Dodge van. Since this happened after the repair it is most likely it’s the reason.Rust in the brake lines can do that to you.